« Help Your School Districts/Administrators To Save A Million Dollars! Please click and view the video below for The Biggest People’s Climate March Ever! Hundreds of thousands of people took to the streets of NYC, other cities in USA and elsewhere in the world, on Sunday (September 21, 2014), Monday (September 22, 2014) and Tuesday (September 23, 2014), demanding world leaders to do more to take serious actions to slow the Climate Change. 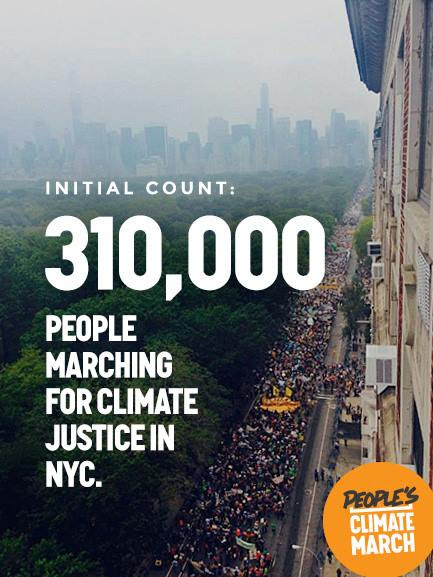 In NYC (New York City) alone, there were 310,000 people showing up to march for Climate Justice. So far, there is no global agreement on what to do regarding Climate Change, even though some countries have already taken actions in reducing CO2 emissions (such as Australia’s previous Carbon Tax, European nations (esp. policies by Germany, Italy, and UK), China’s, Taiwan’s, and Japan’s Feed-In-Tariff for Solar & Wind & switching from coal to natural gas, U.S. has switched from coal to natural gas and increased solar and wind installations). This largest climate march in history involves approximately 1500 organizations, but is mostly organized by AVAAZ (with membership of over 30 million people according to wikipedia) and 350.org . It has brought together great diversity of people from different social, economic, political, and religious affiliations. It is purposely designed to take place prior to the UN meeting on Tuesday, September 23, 2014, when discussion regarding future direction and finance associated with the topic of climate change will be taking place. Here, at Sun Is The Future, we’d like to implore leaders of the world to consider implementing Feed-In-Tariff For Renewable Energy: Feed-In Tariffs (FITs) have proven to be the world’s most successful policy for delivering large quantities of renewable energy generation quickly and cheaply. It will help to develop vibrant renewable energy industries (solar-wind-water-geothermal-wave ) that will Reduce CO2 emissions, Slow Climate Change, Solve Energy Problem, Create Local Jobs, by using our abundant Sunshine and various Renewable Resources. We believe, by implementing Feed-In-Tariff For Renewable Energy, incorporating True Value of Each and Every Renewable Energy, Feed-In-Tariff For Renewable Energy will be implemented most effectively. On Monday, 310,000 people took to the streets of New York City to call for climate action — the largest climate march in history. And on Tuesday, the world’s politicians will gather in New York to talk about climate action — 125 heads of state in total. They’ll be gathering with the knowledge that more people than ever are demanding action, not just words, and that their political future is on the line — as well as the future of the planet. Today people from the communities where fossil fuels are dug up marched alongside people who live where they are burned. Thousands of workers, the people who stand ready to build a clean, renewable energy system, walked alongside indigenous communities that are already leading with their own climate solutions. New Yorkers, including those whose homes were wrecked by Superstorm Sandy, marched in huge numbers, standing alongside international ambassadors from communities responding to climate disasters worldwide. The ripples of the People’s Climate Mobilization are already spreading. A people’s summit outlining the path to a just transition away from fossil fuels starts tomorrow, along with actions targeting corporate polluters in New York. With your help those ripples can spread further, and strengthen — and on Tuesday, hopefully help rock world leaders into action, where they have only offered words before. We hope the UN leaders have heard our voices and will seriously consider implementing Feed-In-Tariff For Renewable Energy With Incorporation of True Value of Each and Every Renewable Energy throughout our planet earth. 6. Let’s Move Our 50 States Toward Clean Energy! The Clean, Renewable Energy Movement Is Here! 7. Help Your School Districts/Administrators To Save A Million Dollars! 8. Join Us, at Sunisthefuture Team at Kiva, to Spread More Sunshine! This entry was posted on Monday, September 22nd, 2014 at 8:25 AM	and is filed under Events, News, Policies. You can follow any responses to this entry through the RSS 2.0 feed. You can leave a response, or trackback from your own site.